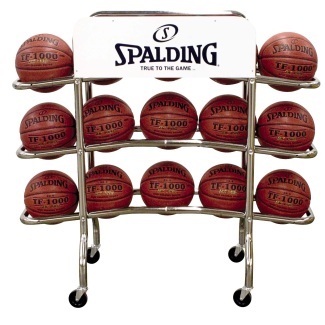 Product: Spalding Basketball Accessories - 68-450 Basketball Cart - Holds 15 Basketballs. Free shipping to the lower 48 United States for this Spalding basketball cart. This cart is very practical for storing and moving your basketballs. This product is great for school gyms and teams in middle school, high school, or college. Practice like the Pros with this Spalding Basketball Cart. This cart will hold up to 15 basketballs. Allows you to easily store and transfer basketballs when practicing. Hold your own 3-point shooting contest. Just get a friend and a timer and start shooting! Try your Basketball Storage Cart out today. Easily mobile with 4 swivel wheels allowing you to push the cart in any direction. Assembled dimensions: 27.75 inches W x 10 inches D x 46 inches H.
Shipping Weight - 47.0 lbs. Competitive Edge Products is an authorized reseller of Huffy / Spalding Basketball Cart. This product carries the logo of both Spalding and the NBA. Difference between the Spalding 68-450 and the Spalding 68-452 Basketball Carts? The structure of these two models are the exact same. The only difference is actually just on the logos of the two units. The 68-452 shows the NBA logo, the 68-450 does not. Dimensions: 51" x 31" x 6"